We are a non-profet orginization and we don't want to charge tax for anything. 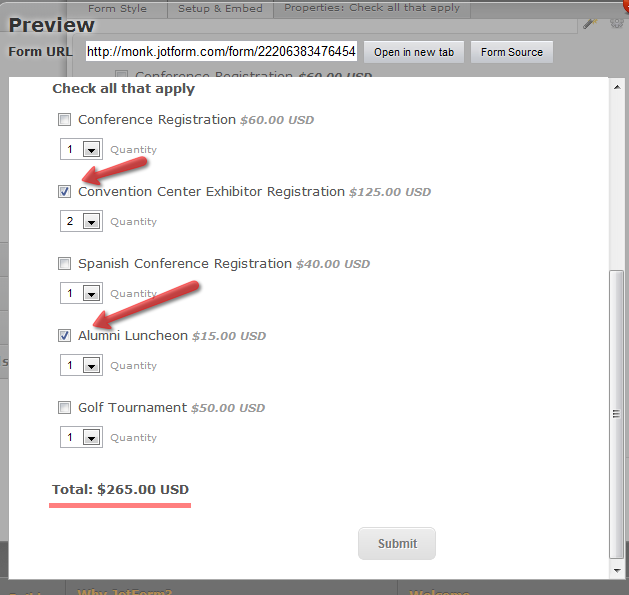 I don't see anywhere on the jotform that allows me to not have this charge in PayPal. Also, a few of the functions don't work when I past the code into dreamweaver. It seems to be a Java error. The "show ammount" and "required" don't function. I wold also like a way for people to add the number of products they wish to buy ex: 3 or 6. Currently they can only check the radio button for each/ONE product. Can a "select quantity" function be added? 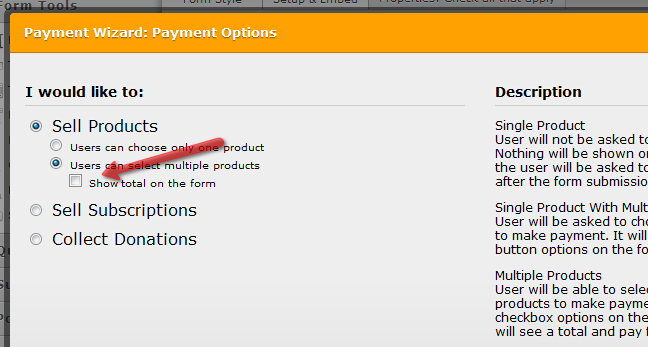 Jotform do not have any tax settings on its payment fields., it is rather on the Paypal settings sdie. For more info on this please check this thread, Mike_T's response seems to be the answer to your inquiry on tax. It seems you had sorted this out already, as I can see in your website that you have quantity option in your form already. But what you rather did not include was the total option which can display the computed total for every checked product. You can update your paypal form by repeating the payment form wizard.. then you can include the total option.